In a nutshell: A shop owned by the family of the Legend whose kababs became famous asTunday kabab. I am sure he himself used to make it way better to have reached such a Legendary status. Address & other details: Tunday (the link shows Rahims. Once u reach Rahims, this shop is on opposite side, few shops later). Ask anyone. We paid Rs. 70 for1 plate kabab,2 parathas & 1 Kinley water. No bill. 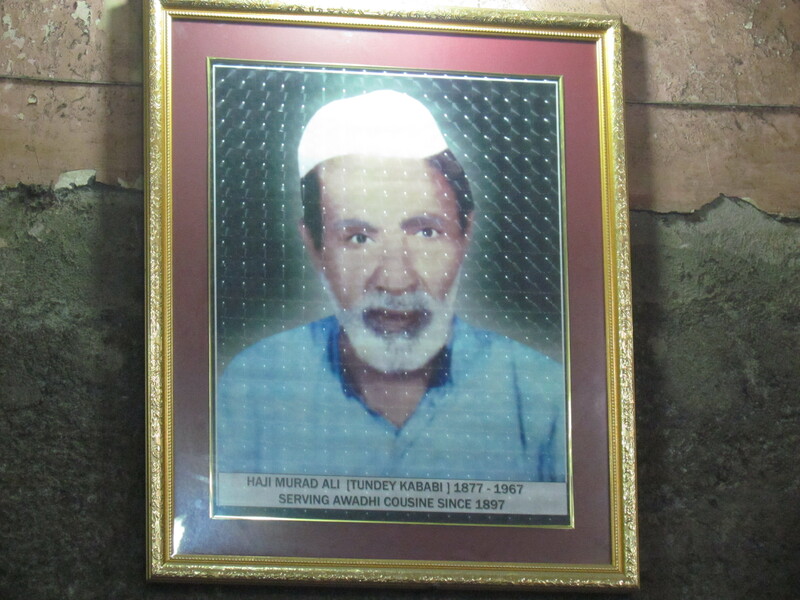 The person who got famous as Tunday Kababi was Haji Murad Ali (1877 – 1967) – Amazing feat that he lived for 90 years in a period when average age of Indians was about 50 years. I had read this somewhere earlier, am unable to recollect – The name Tunday has an unfortunate story – Haji Murad Ali as a kid fell from a height & lost his hand. A person without a hand used to be called ‘tunda’ in local dialect. So when he started selling kababs they started being called ‘Tunday kababs’. Who knew that this unfortunate incident wud lead to a name which wud become a brand a century later. A notification on the wall says they have no branches. 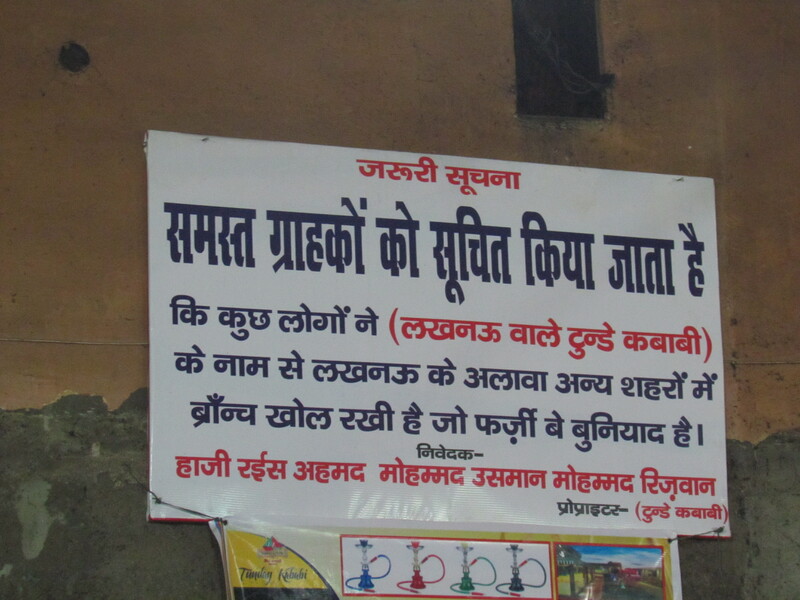 Yet there r many branches of Tunday in Lucknow, Delhi & many other places. 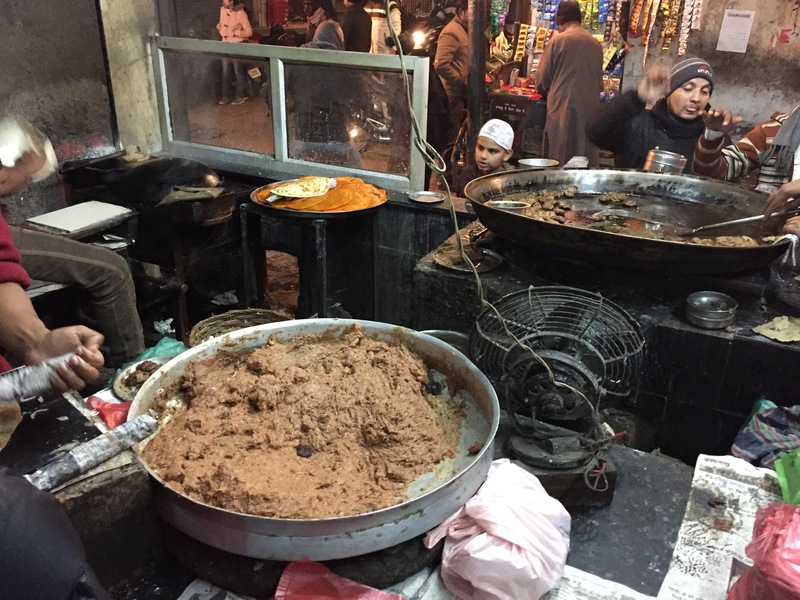 It is undoubtedly true that the kababs at the Chowk shop taste very different than the ones at other restaurants with the same name. They look different as well. 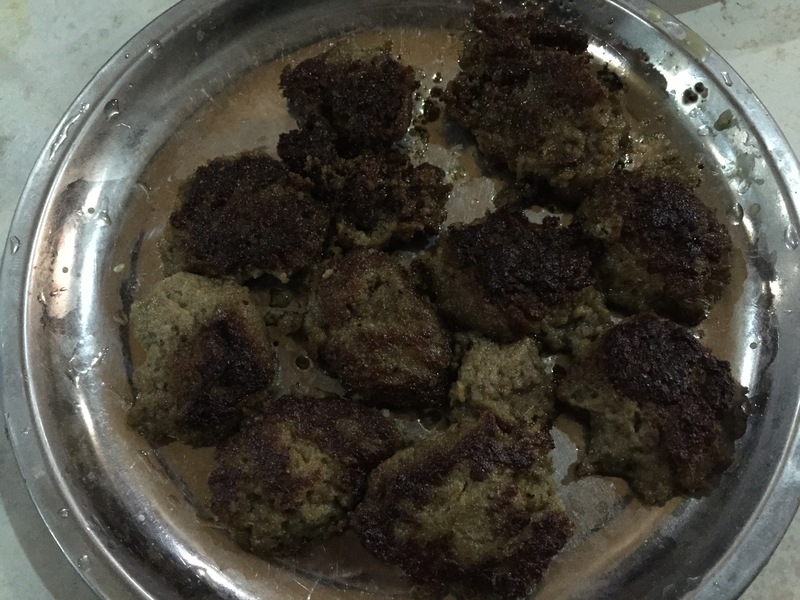 Click here to find the difference in color of kababs at Tunday shop in Gurgaon. The restaurant does not have a signage outside. It has a relatively small frontage but has a very big sitting area inside. The floor is made of white marble but has a worn out look. The ceilings & walls also look worn out. Lighting is sub optimal etc ………………. By the way who cares for all that when u get to eat some really unique kababs that u remember for a while. The waiting staff is very good. They take care & r very efficient. 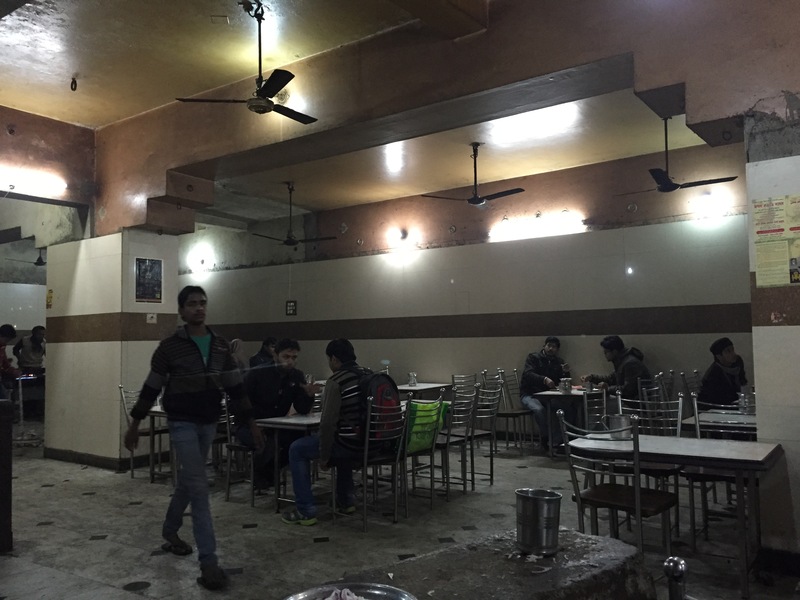 Detailed Description – In case u have the Time to NJOY reading: There r only 2 items on the menu – tunday kabab & parathe (ulte tawa ke parathe). The other restaurants with the same name serve other Mughlai dishes though. Click here to read about Tunday Gurgaon. 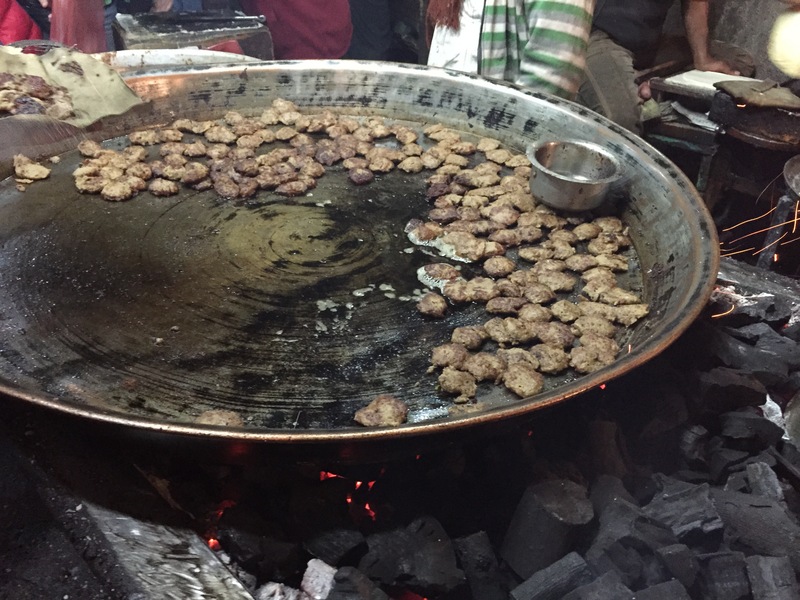 The kababs were being made in copper vessel on charcoal fire. Last time I had been there, they were using wood as fuel. 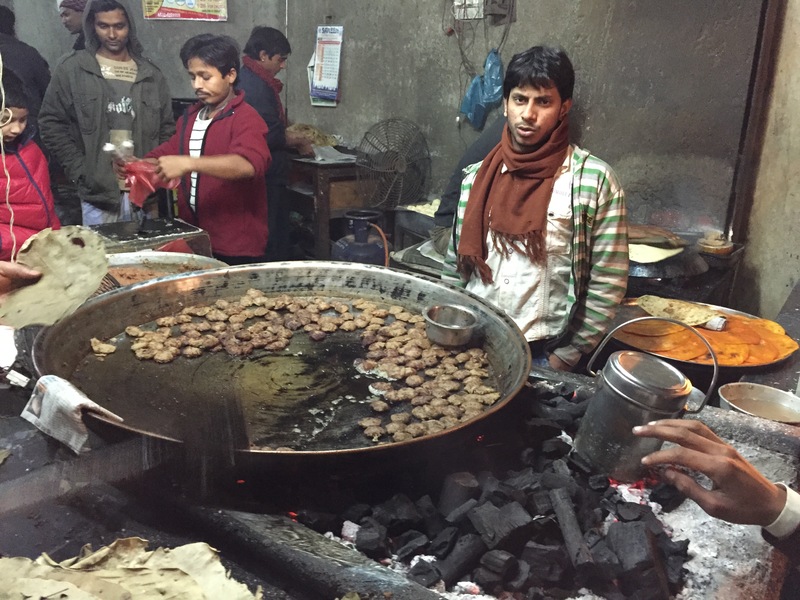 The combination of the charcoal & coal fire gave the kababs a smoky feel. The kababs were soft & tasty within. Taste was beyond ‘good’ but not outstanding. The outer layer was quite crisp – More crisp than I have ever tasted in any Galawati. They had burnt edges as well that I liked a lot. 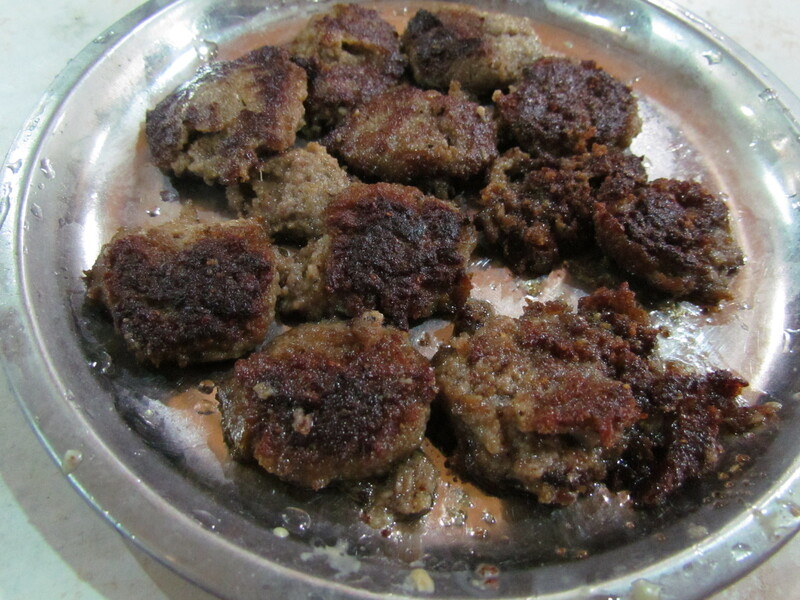 Usually Galawati kababs r so soft that they cannot b picked by hand without breaking. These ones cud b picked maybe in 2 pieces as the outer layer wud hold the center from falling off. The flavor of meat was present but flavor of spices were suboptimal. A Galawati at Kitchen of Awadh, Oudh or Dum Pukht wud b way more flavorful . Well, if we consider the price that Tunday charges, I wud not b that fussy. 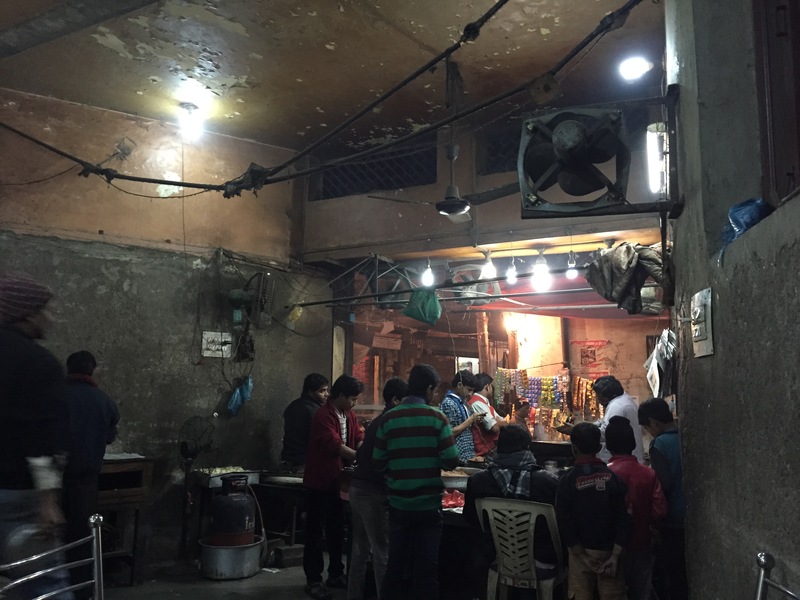 The whole neighbourhood can taste Tunday kababs at the price of 1 plate Galawati at Dum Puhkt. Rate the kababs 3.5/5 As we waited for the bill , we saw the residual fat on our plate condense into white vaseline lookalike patches. They gave us torn newspaper as substitute for tissue paper. 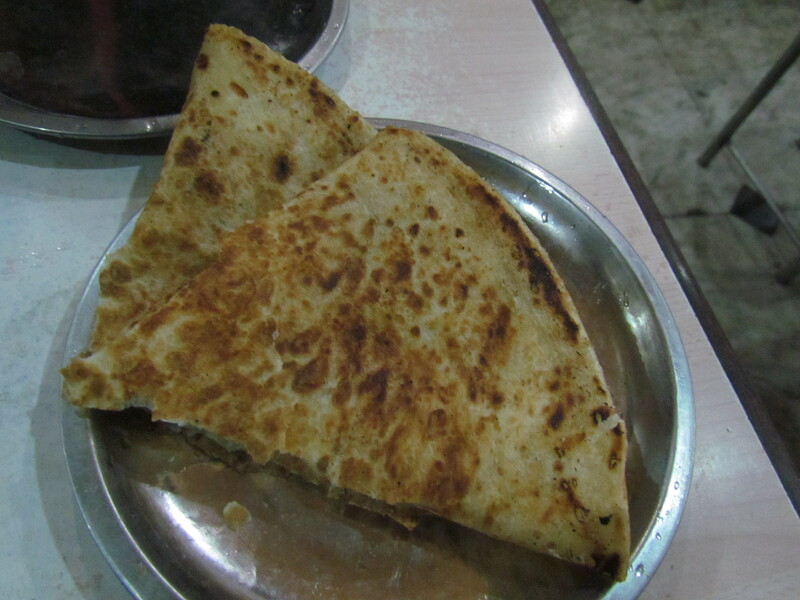 Paratha was soft, not rubbery & was good to taste on its own. It was a bit greasy though. Rate it 3/5. Overall rating of Kabab parathe at Tunday averages out to 3.25/5. 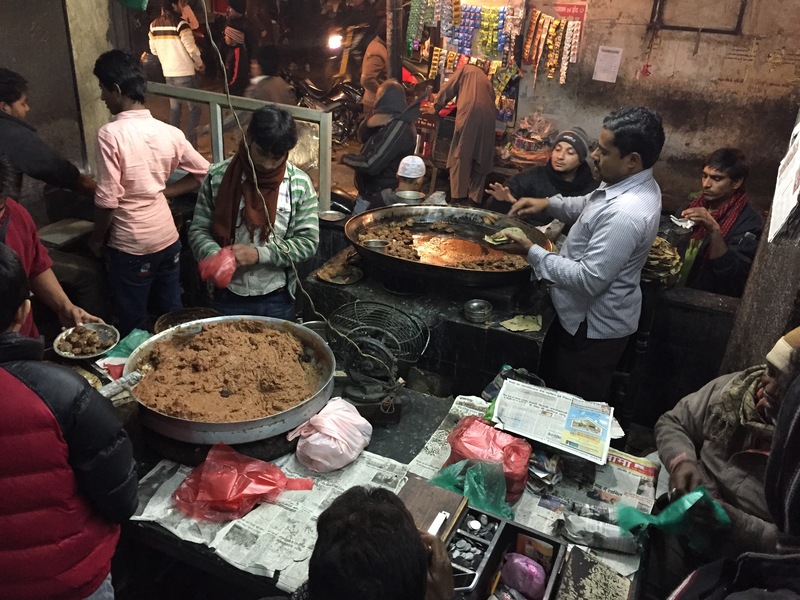 I wud go there again for that unique smoky flavor, if I am in Lucknow for a week. For a short trip of 1-2 days I wud avoid coz I have found better options.